While scouring the web looking for images of the X-Men’s resident weather witch, I stumbled upon the artwork of Michael McDaniel. I did not find any personal information about this artist, and it doesn’t appear that he has any published comics work to his credit. He seems to be primarily making a name for himself as a pinup artist. The above image of Storm is definitely a more classic look for her, but with a touch more muscle than I am used to seeing Ororo portrayed (at least before she went punk rock). I like the expansiveness of the pose and the way McDaniel illustrated her hair and tiara. I do think the cape is a bit too small, but we can blame that on unstable molecules. 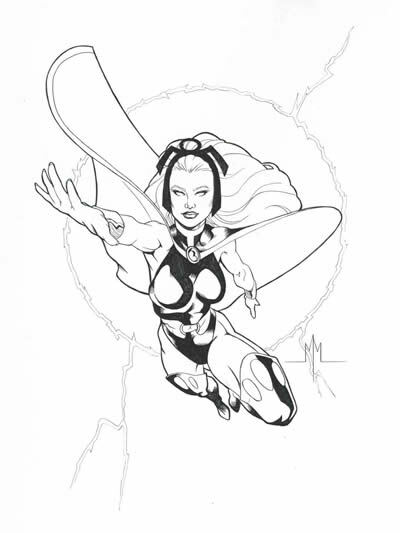 For another version of Storm by McDaniel check out SwanShadow’s blog. Here’s a whole ‘nother kind of Storm in the form the Fantastic Four’s resident hothead, Johnny Storm, aka The Human Torch (as portrayed by Chris Evans). I like the art board that McDaniel uses. The texture gives his work a rough edge which is nicely contrasted with the smooth lines. The design element of the yellow rectangle gives this image an advertisement vibe. More beefcake is on the menu as McDaniel draws his version of Shang Chi, Marvel’s Master of Kung Fu! Again, I really enjoy the pencil gradations. DC’s Zatanna, Mistress of Magic is casting a spell on you in this sassy pinup. McDaniel certainly has saucier versions if you are interested. Superman doesn’t seem to be in much of hurry to get into his full costume, does he? Caught in mid-transformation, this image of Clark Kent is really all about the musculature (and maybe the pin stripes of his shirt). I’m getting a definite 80s Nagel fashion illustration influence here. Oh, Mighty Isis! McDaniel gets into depicting the intricate jewelry of this DC Comics’ heroine. She looks resolute as she flies powerfully through the sky. One last slab of beefcake in the form of this Brandon Routh inspired Superboy. Apparently, it’s very important that you check out his superhuman six pack! If you are into good/bad girl/boy artwork, then check out more McDaniel artwork here. Cheers!